FILE - Afghan security forces take positions following an operation against Islamic State militants in Pachir Agam district of Nangarhar province, Dec. 3, 2016. Russia, China and Pakistan bowed to Afghan complaints Tuesday, announcing after talks in Moscow that Kabul will be invited to participate in future meetings on the threat posed by Islamic State militants in Afghanistan. Afghan officials had objected to being left out of the three-way talks in the Russian capital, ostensibly held to discuss "the deteriorating security situation in Afghanistan." The three nations also said they were interested in facilitating peace talks between the Afghanistan government and the Taliban. The long-running Taliban insurgency poses by far the greater threat to Afghanistan, whose forces have been on the defensive for the past year. But members of the so-called Islamic State group have been trying to establish a foothold in Afghanistan, in some cases fighting directly with the Taliban. Islamic State fighters search weapon boxes in a Russian base in what is said to be Palmyra, Syria, in this still image taken from video uploaded to social media on Dec. 13, 2016. Participants in Tuesday's meeting said it was the third session of their trilateral "working group" on Afghanistan. In a joint statement released by Pakistan after the talks, they expressed "particular concern" over "increased activities of the extremist groups including the ISIL (Daesh) affiliates in the country." ISIL is another acronym for IS. The statement said Beijing, Islamabad and Moscow had agreed to continue their consultations in an expanded format and would welcome the participation of Afghanistan. The group previously suggested it might include Iran in future talks. 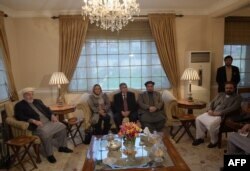 "The participants agreed to continue their efforts towards further facilitating the Afghan-led, Afghan-owned peace and reconciliation process in Afghanistan according to the known principles of reintegration of the armed opposition into peaceful life," the statement said. Hours before the Moscow meeting, Afghan Foreign Ministry spokesman Ahmad Shekib Mostaghani said that regardless of the good intentions of the participants, the Moscow talks would not help the situation in Afghanistan, where government forces have been battling Taliban insurgents for 15 years. The joint statement said that China and Russia, as permanent members of the U.N. Security Council, had confirmed their "flexible approach to delisting Afghan individuals from the U.N. sanctions lists" as a contribution to peace efforts in Afghanistan. The Taliban has identified removal of international travel and financial restrictions on its leaders as one of its conditions for engaging in reconciliation talks. The Afghan government has recently sent a formal request to the U.N. sanctions committee seeking delisting of members of the Hizb-e-Islami group, with which Kabul signed a peace deal. FILE - Members of Afghanistan's High Peace Council talks with delegates (not pictured) from the Hezb-e-Islami group, during a meeting in Kabul, March 17, 2016. The group, led by Afghan warlord Gulbuddin Hekmatyar, agreed under the peace deal to quit violence and join mainstream politics once the delisting happens, paving the way for the warlord to return to Afghanistan from years of hiding. Russian officials say that IS is trying to expand its influence to Russia and China through Central Asian states that share borders with Afghanistan. Moscow's permanent representative to the United Nations told a Security Council meeting last week that more than 700 IS terrorist families have arrived in Afghanistan from Syria. The deteriorating Afghan security situation is encouraging IS fighters to look at the country for refuge, he added. Russia recently admitted to having contacts with the Taliban following reports Russian authorities are trying to help the Islamist insurgency fight IS militants. But Moscow insists the links are meant only to ensure the protection of Russian nationals in Afghanistan and to encourage the Taliban to join peace talks.